Fatherhood is one of the most difficult jobs I have ever had, but it is definitely the most rewarding one. For all of the single moms and dads out there, my hat goes off to you. I have been there, done that and have the t-shirt. Well actually there isn’t a t-shirt but, as you well know, there are the lessons and scars that come along with the challenges of parenting alone. Giant Kudos to the “step” parents who step into what can seem like an impossible role at times. I’ve never been a fan of the term “stepparent” because I believe parenting is a full-time, fully committed, responsibility and shouldn’t be referred to in a slightly removed position of less importance. 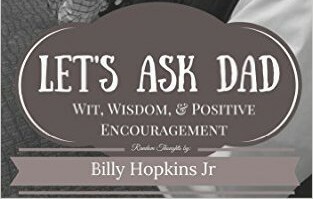 Let’s Ask Dad began as a passion project of wanting to become a published author. It turned into a reflection of the life of my older children. The stories are too numerous to share, but the thing I am confident of is that they will continue to come. I am blessed to have six beautiful children. Ashton, Brianna, Cierra, Dawson, Easton, and Zephan are all growing into wonderful adults now and they will surely provide lots of laughs and even more stories as grandchildren become part of the bigger picture. My wife Anne came along after the breakup of my first marriage and amazingly stepped into a parenting role that I know I probably would’ve never considered. That may seem shallow, and it probably is, but Anne provided the nurturing and woman’s touch that was void in a single-dad’s home. I have often said that Anne was either a crazy or a Godsend. Maybe she is a little of both! Who takes on the role of wife and mom to a man and six young children unless they are? Anne and I now have two more boys, Hudson and Beckett, that are nothing less than a miracle. These little guys have enriched our home and brought about a reset moment as we begin the whole process again. Many men my age are settling into to their role as grandpa, I am blessed to have grandchildren and my own children at the same time. Does it require a lot of energy? It does, but in my own humble opinion, there is no greater joy than being a father. I believe raising my own little boys will also help me focus on helping the grandbabies to become everything God has called them to be and not just take on the role of spoiling them. Oh, they’ll get spoiled enough by Anne! I have no doubt about that happening. "Hump Day" results of "Monday Blues"
Autograph eBook for "Let's Ask Dad"